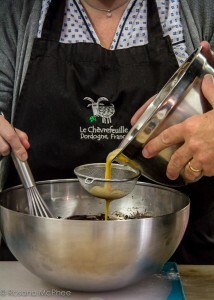 Look no further, simply buy a voucher for a days cookery course experience in the Dordogne. This can be taken up by your loved one any Sunday or Tuesday throughout the next 12 months at their leisure. To purchase this great gift, click on the buy now button, enter the amount 150 and complete with any major debit/credit card. Please do not forget to put in your comments that the payment is for a cookery course voucher and the name of the recipient. Once received we will attach a voucher for you to print off and put in a card for the big day! Simple. You can also purchase a voucher for any amount towards any of our courses and tours. Using the same method, please put in your comments the name of the recipient. To complement your CookDordogne Cookery School experience we invite you to stay on-site with us at Le Chèvrefeuille’s B&B guesthouse and self catering gite accommodation.